Although I've been home for almost a week, I haven't had much time until now to sit down and write about my experiences at the Ballet Magnificat! Teacher's Workshop in Jackson, MS. It was a wonderful time, full of so much learned, not only about ballet, but also about my Awesome Savior, Jesus Christ. So much was crammed into two weeks that one post won't do it justice, but I hope to at least give you a glimpse into what I experienced. My parents had been out of town for two weeks prior to when I left for the workshop, so when I left the house at 8:30 a.m. on Saturday, June 27th, the first stop was to drop Jubilee off at her friend's house, where she would be staying until mom returned the following week. Once that was completed, I hit the road and enjoyed the quiet drive to Jackson, MS. After 5 hours, I arrived, registered, and soon began organizing my things into my dorm room. I had quite a feeling of deja vu to be back in the same Gillespie dorm I had stayed in 2 summers previously for Ballet Magnficat! Summer Intensives and all last year while attending Belhaven College. So much has happened while staying in that dorm! The first day was quiet. 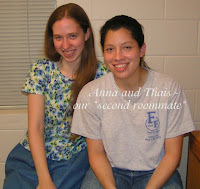 My roommate arrived before supper, and I enjoyed getting to know her. 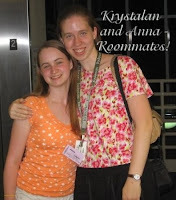 Krystalan turned out to be such a blessing as a roommate and a really good friend! We enjoyed spending two weeks doing so much together! There were 25 teachers that came from many different states, and it was so fun and interesting to hear their experiences as a teacher and learn from their recommendations. As I'm just starting out teaching, it was wonderful to hear the practical things that have worked for them and other things that haven't (to avoid!). The first Sunday was another quiet day, as we had orientation and teacher meet-and-greet time, and then had a lot of free time. I was able to spend an hour with my friend Grace, who is working in Jackson this summer, and other time was spent getting to know the other teachers. 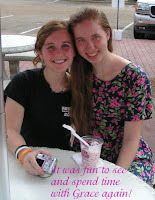 We went on our first "Bop's Run" to get frozen custard - a delicious treat! Each weekday we had a schedule of all of the teacher and student classes that were being offered, and were able to pick which ones we wanted to attend. I went to all of the teacher's classes that were offered, in order to learn as much as I could about teaching while I was there! I also took or observed a few technique, conditioning, and variations classes with the students. Each day typically had chapel at 8:30 AM, the morning class at 10-11:45 AM, lunch, and afternoon classes from 1:45-3 PM and 3:15-5 PM. After supper, we had something from 7 until 9 or 10 PM, going to a Ballet Magnificat! company performance ("Before His Throne - Boldy" and "The Scarlet Cord" were both really good! ), large and small group Bible studies, Creative Worship, dinner with Keith and Kathy Thibodeaux (the founders of Ballet Magnificat! ), and, finally, the ending student gala performance. The days were long and tiring, but we also had enough short breaks in between classes, that it was actually very relaxing. Without all of the things calling for attention at home and having a break from the distractions of the computer, it was quite a nice vaction. I only danced an average of 1 class per day, because I wanted to learn all that I could from the lectures for teachers, but it was nice to at least be able to dance some. Not having to wear tights all day in the hot July humidity was definitely a relief! The teacher's classes taught me so much - I still haven't begun to process it all! However, the staff at Ballet Magnficat! was so generous to share so many of their ideas and give us many helpful handouts and curriculum. I heard various dancers, teachers and staff teach on lighting, dance school administration, dance curriculum for older and younger students, functional anatomy, injury prevention, conditioning for dance, how to apply textbook directions to real student's bodies and their limintations, encouragement to maintain a high Christian and moral standard in our teaching, choreography, imrovisation, nutrition, pilates, and creative ideas for teaching little ones to worship with dance. We also had four ballet technique classes just for teachers, learning from four of the master teachers at Ballet Magnificat! All of it was such a blessing, and it has given me encouragement and tools to begin teaching again this fall. I can't wait to put the things that I learned into practice and continue on using ideas I gleaned at the workshop. 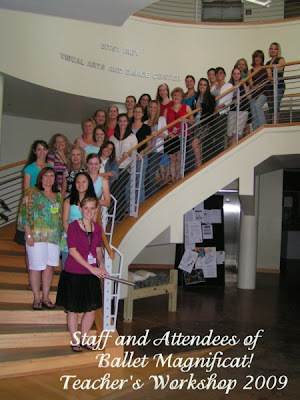 If you are a dance teacher, I definitely recommned attending a Ballet Magnificat! Teacher's Workshop at least once - you will learn so much and be inspired! There were a few teachers that come every summer, to get the refreshment and new ideas that they need for another busy year. 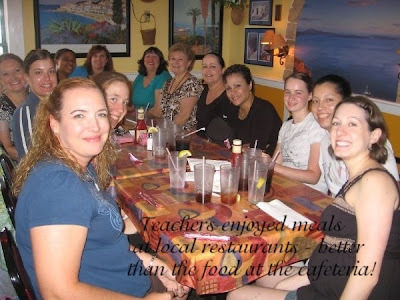 It was also wonderful to see how all of the teachers bonded and encouraged one another. Each teacher came from a slightly different background and their teaching was geared toward different students. Some were in Christian studios, others taught in a secular environment. 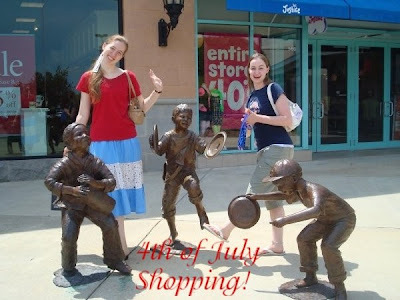 There were many special outings arranged for us to get to know each other, including a Saturday, July 4th breakfast at The Corner Bakery Cafe, shopping, a prayer retreat, and dinners at three different delicious restaurants. 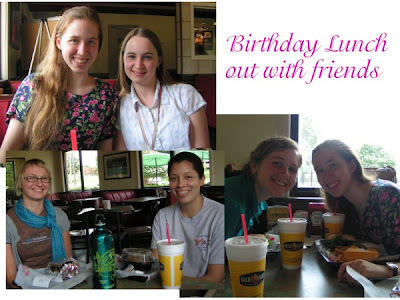 On Sunday, July 5th I turned 19 years old and celebrated yet another birthday while at Ballet Magnificat! Everyone was so sweet, and my roommate and packages from home helped make things special. Grace picked some friends and myself up for lunch out at Backyard Burger, and after chapel she again picked us up to go out for more ice cream at Bop's and a quick browse through Barnes and Noble. It was a blessing to talk on the phone to Elijah and my Mom that day, as well as two dear friends and a surprise call from family friends vacationing in Arizona! It was a relaxing day as I watched part of the musical "Newsies," caught up in my journal and remembered years gone by, and finished re-reading Sense and Sensibility. Our counselor, Colleen, is a dancer in the Ballet Magnificat! Omega company, and she was a wonderful encouragement to me. Her love for the Lord and enthusiasm for His Word and prayer was inspiring. Our small group was also one in which we could encourage each other and "spur one another on" in the Christian walk. The last time we met, we took turns praying specifically for each person, and it was a sweet time of fellowship. The Lord also taught me a lot about Himself and His direction for my life. While I feel inadequate in many things, God showed me how sufficient He is for everything that I need. While I was worrying about what I didn't yet know, God comforted me by giving me the assurance that He is the best Teacher I could have. The theme of this year's intensive was "Holy Invitation," and we were challenged and encouraged to approach God's throne with boldness because of the work Jesus did on the cross, covering us with His blood. We were challenged to renounce things we'd made into idols in our life and throw off all of the hindrances to run the race with perseverance. Having all of the time specifically set aside to worship and seek after God was so refreshing. It was also a blessing to get to know the members, teachers, and staff of Ballet Magnificat! They are such an inspiration in how they hold to a high standard and glofify the Lord with excellence in dance. I was first inspired to dance by watching one of the very first Ballet Magnificat! videos, "A Symphony of Movement" and dancing around the house to the music as a little girl. Now, years later, it was such a blessing to be able to go as a teacher and learn from them. The second week quickly passed by. Unfortunately, I came down with a sore throat on Wednesday that developed into a pretty irritating cold by Friday, but even in the midst of uncomfortable stuffiness, I was able to keep learning. We finished off with a last teacher's outing to Bop's for more ice cream and a great time of sharing. I left around 6:30 AM on Saturday morning, eager to get home. The radio didn't work most of the way and my voice was barely there due to the cold (which cut out a lot of talking on the phone), so the ride back was a quiet one, allowing me good time to think, process things that had happened, and pray. Things were off to a full start soon after coming home. It took a while to catch up on things that had happened during the last two weeks, and I soon jumped full-swing into preparations for this summer's musical, holding auditions on Tuesday and directing the first walk-through rehearsal last night. I'm looking forward to all that God has in store for the rest of this summer! Anna, I enjoyed reading all about your times at Ballet Magnificat! Pictures are worth thousands of words, so I was able to get an even better picture of your time there. I cannot wait to see and hear about what the Lord does in you, and in your next year of teaching, through your experiences back in Jackson! Hi Anna, my name is Alyssa. I was at the Ballet Magnificat intensive for the same two weeks, as a student! Colleen taught one of our classes. I loved it there, too! It taught me about dancing - and living - for the stated purpose of glorifying Him, instead of going around hungry for solos and applause and finding it nice if I could do a Christian piece now and then. Our small group prayed individually for each other on a few different occasions, and there was something truly beautiful about it and about the entire two weeks. I started saving to go back next year, this time for all four weeks, before I even went home (reserving pocket money I had brought for the trip.) Just now, I was looking for pictures of Ballet Magnificat!, and the name of your site caught my eye. 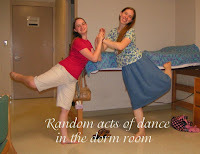 I think you have a great site with a much-needed message, and it is a pleasant surprise to be able to connect this way with someone else from the Ballet Magnificat! intensive. Ella: Glad you enjoyed it! Alyssa: It's good to hear from you! It's neat that you were at the intensive as well! God is so good in how He uses Ballet Magnificat for His glory, not only in dance, but also in drawing people closer to Himself. I'm glad you were encouraged through your time there, and hope you get to go back next year! Hello Anna! My name is Sarah; I am 18 years old, and I too was homeschooled all my life! and I too was at Ballet Mag this summer, though as a student, for four weeks. It was my first time, and I loved every minute of it! Oddly, in the months before I went I spent some time googling Ballet Magnificat, and your blog was one result that came up! I enjoyed reading about your experiences as a student! Anyways, when I actually arrived, I saw you there- it was an interesting thing recognizing someone I'd never met in person! My own ballet teacher, Amy Sagastume, was at the teacher's workshop as well. I lve her, she's awesome and means a lot to me! =) Colleen is amazing, I love her too! =) Omega's coming to my town in January, so I'm very excited to see them again. Especially as my dear counselor, Naomi Gilman, will be with them! Anyways, just wanted to say hi, and I enjoy reading your blog! Sarah: Nice to hear from you! I'm glad that you were able to attend Ballet Mag as well. It was definitely a wonderful experience!